Man, you turn your back on an egg for, what was it?, a half a minute?… Sheesh! But, I’m eating it anyway. I’m hungry and had to have something before my Diovan gets me all lightheaded. But it’s been that kind of morning. Got up late this morning. Well, later than my normal late, and I wanted to get outside to once again tie up my tomato plants. Now they’re secure to the fence. I’m confident the fence weighs more than the plants so the risk of a cave in is at a minimum. And I also had to change (ewww, I just got a piece of burnt egg!) the battery in the electronic timer for the sprinklers for the garden. I’m hoping that’s all the problem is. The other night, when we got home from Yonathan’s christening, the sprinkler was still running, three hours after it was set to shut off and then when it was due to come on, it wouldn’t. 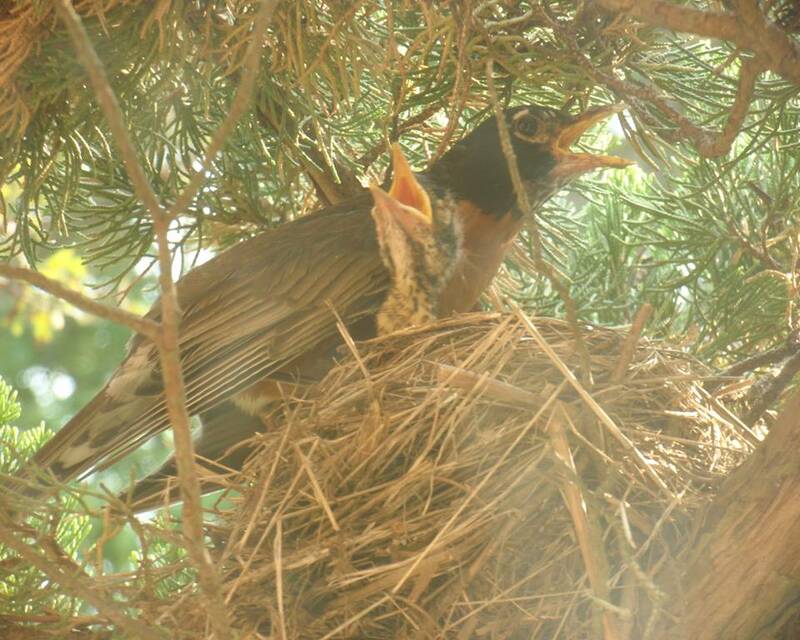 They’re about to fly the coop, but I finally got a shot of Mama Robin and her babies in the nest right outside my kitchen window. (Egg…blech! I’m thinking dizziness is preferable to burnt egg. Damn blood pressure!) Every time I saw her out there in the nest with them and came to the window with the camera, she’d side eye me and take off, leaving her poor defenseless scraggly robinettes squawking helplessly. If you look real close, you can make out the second one under mama’s wing. I feel so truant with my blog these days. I think the horrendous heatwave we’ve been suffering has gotten the better of me. But I have been finding time for some fun things, even though I haven’t been very blog creative. I have, however, been being creative in the kitchen, putting to use some of my garden bounty. Still, no tomatoes; they’re not ripe yet, but the plants are growing out of control and it’s beginning to look like a game of Cat’s Cradle the way I have to keep tying them back. But this was a nice quiet weekend, albeit a hot and lazy one. 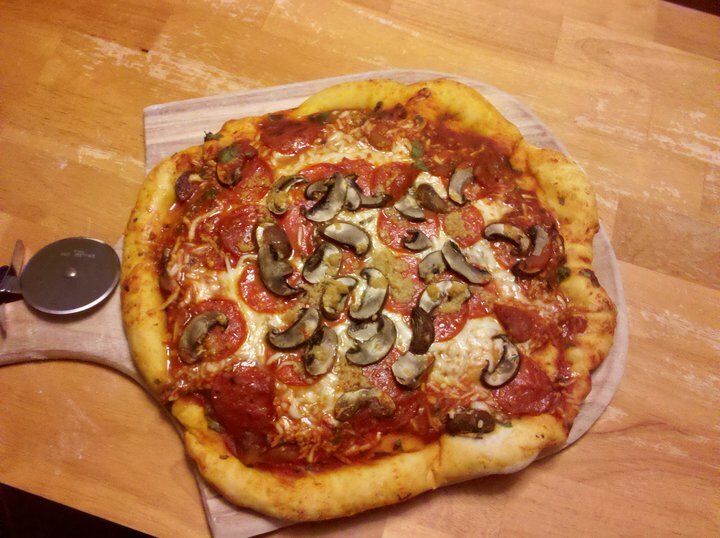 Friday night we made pizzas from scratch; a pepperoni mushroom one and a margarita pie. 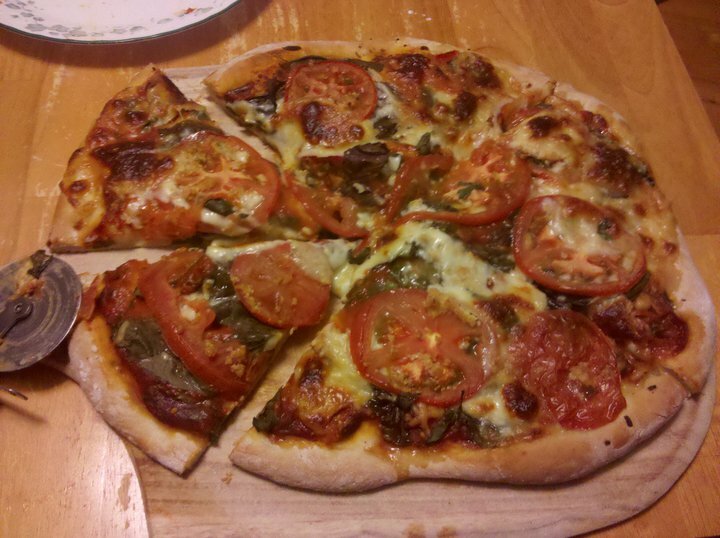 I made the dough and doctored up the leftover sauce I’d made earlier in the week with some extra basil and parsley from the garden. 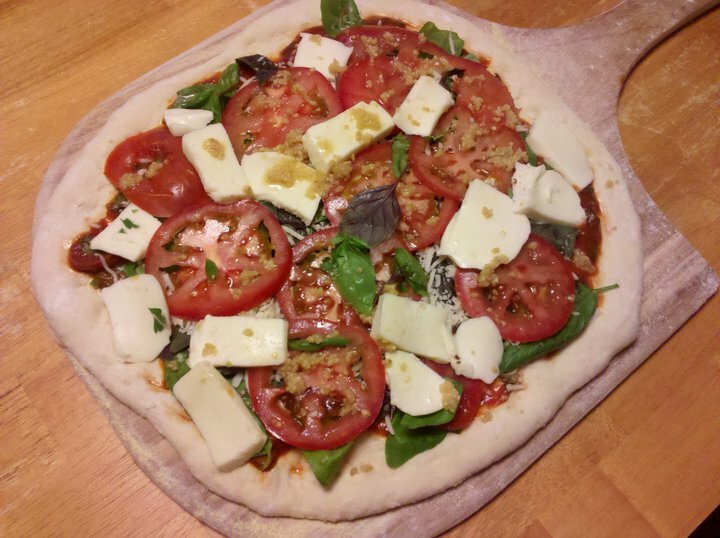 When the tomatoes are ready, we’ll make more pizzas. Then on Sunday, after discovering what yummy French toast our summer squash bread makes, we deflowered the mint. 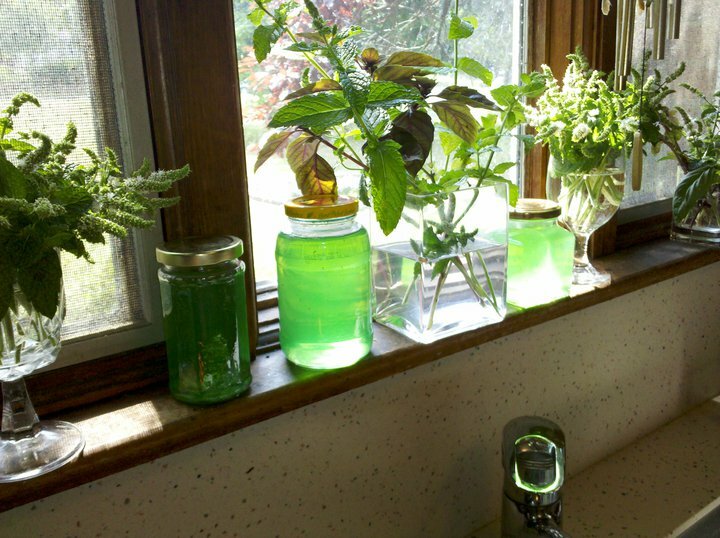 That, too, is spreading like mad and I thought, oh, sure, let’s make mint jelly and I got three jars out of it. I wasn’t planning on having that many jars or of “putting them up” and I didn’t have any empty canning jars (or lids) to make it official, but had these empty jars on hand and went through the regular canning steps to ensure a good clean product and the best thing…while we watched a movie in the other room, one after the other, the jar lids popped creating the vacuum we never expected to happen with these jars. Now all I need a supply of lamb chops and I’ll be a happy boy. So, here are some pics of my kitchen at work this weekend. We thought it might be fun and advantageous to use up some of the bounty of summer squash growing in the garden and decided to make bread. 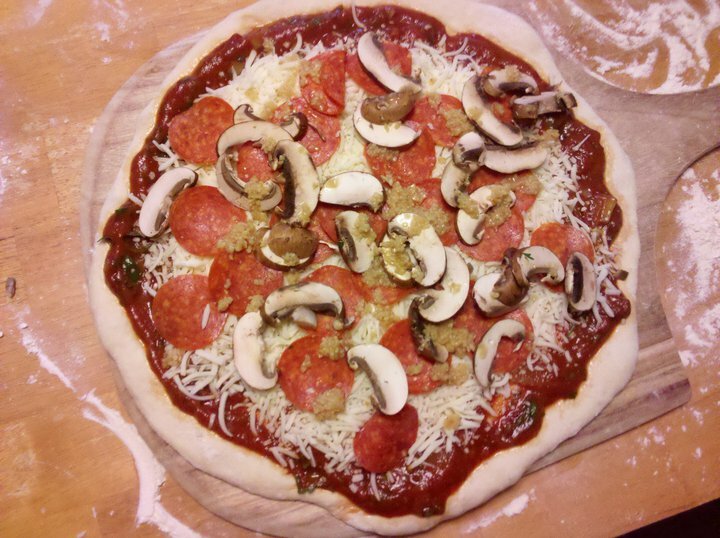 I found a basic recipe and we doctored it up with different flavors. We had a plain (flavored only with cinnamon and nutmeg); a mandarin/cranberry; a walnut/raisin with a splash of molasses and a poppyseed/lemon. They took longer to bake than anticipated. That was my fault; I should have known better. I should have split the batter into two batches each and made eight loaves instead of four, but that’s all hindsight now. 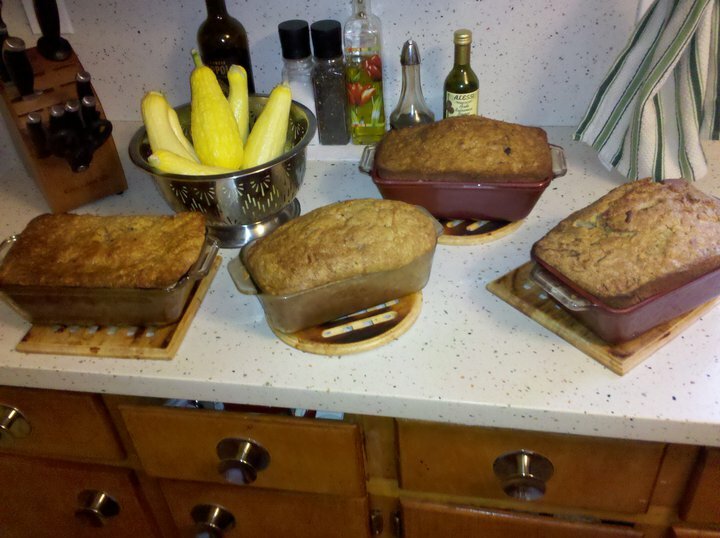 It didn’t look like a near disaster would ensue or that the breads would go on seeming like they’d never finish baking. After the initial time period and they were still like soup in the loaf pans, back in they went and again and again. So, while they baked, I went in the other room and began flipping through the TV channels. I heard the chime sound indicating the over had once again reached the set temperature after the door had been open for a few minutes while I was checking on the breads and for some reason, I thought it might be beneficial to increase the baking time and adjust the timer. My guardian angel was on overtime because when I reached the kitchen, I saw the oven was on fire. The batter of one of my loaves had bubbled out and landed on the heating coil and went up in flames. Thankfully in short order the fire was extinguished and after the shock was over, I closed the oven door to let baking resume and reset the timer. When those 20 minutes passed, I checked on my breads, but realized I never relit the oven after I shut if off to take care of the fire. I reset the temperature, reset the timer, continued fanning out the house. Then the “what if’s” began…what if I hadn’t gone to check the timer, what if we had gone back outside to the patio with our coffee…. Finally my breads were baked and quite tasty, but now I know, this deceivingly innocent batter means business once it gets cooking. It’s also St. Swithin’s Day. St. Swithin, actually Swithun was a Saxon Bishop of Winchester, who, as he lay on his deathbed, asked to be buried outdoor, where he we would be trodden and rained upon. After nine years of his wishes being followed, the monks of Westchester moved his remains to a shrine inside the cathedral on July 15, 971 and there was a heavy rainstorm during that ceremony. That was the birth of the old wives’ tale that if it rains on St. Swithin’s Day, it will rain for the next 40 days and if the weather is clear, fine weather will ensue for 40 straight days. For forty days ‘twill rain nae mair. Today is a beautiful day but St. Swithin never met Brian and Ariel… just sayin’. Today also marks the eighty-ninth anniversary of when the first duck-billed platypus in the U.S. at New York Zoo. And today is the 43rd anniversary of the premier of One Life to Live. I’m trying to think exactly when it was I first started watching, but it was before our beloved Erika Slezak took over the role of Victoria Lord (Riley, Burke, Buchanan, Carpenter, Davidson, Banks). I’m not sure if it was with Gillian Spencer, the actress who played the part until 1970, but it was most likely with the second “Viki”, Joanne Dorian who vacated the role in ‘71 when Erika Slezak took over and has remained ever since. However, doing some investigative work, it was sometime in 1970 because I remember the character Marcy Wade, played by Francesca James, who helped make Viki’s life a nightmare by falsely claiming “Niki Smith” Viki’s alternate personality (she suffers from multiple personalities) was again re-emerging, to help drive a wedge between her and Steve Burke so Marcy could have him all to herself. But in a scuffle between Marcy and Steve with a gun, Marcy was shot and she died. And, Steve Burke came into the picture, romancing and eventually marrying Viki, when Joe Riley, Viki’s first husband was presumed to be dead, but he was later found being taken care of by Wanda and that nullified that Lord/Burke union… oh, I could go on. But that was in 1970. So, therefore, I’ve been watching steadfastly since 1970. So, happy Anniversary One Life to Live. And thanks! God bless the children…Caylee Anthony and Leiby Kletzky. Hi, I’m here! Just thought I’d give you an update on how my garden grows. Well, I’m picking squash faster than I can use it, but I’m finding ways to use it. Raw in salads, with arugula and fruit and cut up in chunks in spaghetti sauce. I’m thinking of making a squash version of zucchini bread. It can’t be much different, can it? The tomatoes are popping all over the place, but are still green. I’ve been using my herbs (mostly the basil and parsley) in just about every dish, though I find it’s not so great on Cheerio*s. Who am I kidding? I don’t eat Cheerio*s. That has to be the worst cereal ever! And my corn! Thanks to a ‘how to pick corn’ video I found on YouTube, I’ve learned that corn has both boy and girlie parts. And one of my corn stalks has girlie parts!! That’s the silk and the flowers that pop up at the top of the stalks is the boy part and in the wind (or sometimes by shaking) the pollen from the flowers falls on the silk and that’s what makes the corn grow. So much fun. I haven’t been able to use any of my thyme because wasps took up residence in that pot. And now it seems the thyme is withering, but also it looks like the wasps have vacated. So, with that in mind, maybe it’s time to harvest and let it dry before it all dies. We bought these alleged wasp traps that supposedly attract every known flying pest including yellow jackets and hornets. So far I’ve trapped countless gnats and one cricket. I find my flip flop takes care of the wasps just fine. So, on the heels of the smoking ban, (which I still take issue with) yet another governmental intervention is afoot. It’s been in the works for a while, but now the incandescent light bulb we’re so familiar with is being phased out in favor of the curly CFL (compact fluorescent tube light bulb) because they are money saving. Yeah, they might save money, but do you know how many I’ve replaced already? I have some bulbs in the house that still work that have not been changed in the 13 ½ years we live here. And, those CFL’s, as it turns out, is a hazardous affair should they break. Of course, cleaning up a broken light bulb isn’t fun, but it’s simple in comparison. Sweep up the broken pieces, vacuum, and walk around barefoot to find what’s left on the floor. There’s a whole safety-ensured procedure for collecting shattered CFL’s; a before, during and after, all just short of a Hazmat team setting up shop in front or your house. The directions for “before” are: vacate the area of people and pets; air out the room for up to 10 minutes, shutting off the air conditioning (or heat). But to save time, during that 10 minutes you can collect cleaning materials; stiff cardboard, sticky tape, damp paper towels and a glass jar with a lid. The “during”: be thorough (really, Einstein?) and place the remnants in a lidded glass jar. “After”: promptly place all debris in a protected area until it can be disposed of properly and don’t leave any clean up materials indoors. Continue to air out the room and leave the air conditioning (or heat) off for several hours. Thank you, Government! All I want to do is see in the dark. Of course you can prevent all this by allowing the bulb to cool; handle bulbs carefully (Einstein is busy today! ); don’t install in fixtures that can be knocked over; use a drop cloth or a towel when changing a bulb. Well, here I am, back from my vacation, which was not, as I/we were oft reminded of with a sarcastic bent, Provincetown, the place we deemed our vacation spot for 22 years running. But because of the expense of the house construction, we could not justify the hefty price tag of that same vacation. And that was fine. We put on our big boy pants and dealt with it. And it was actually nice to do smaller things throughout the week; to have the house be finished and to be able to enjoy it. But we will return there one day. So, I tried to figure how to best capture my vacation for the first blog in, whew, how many days? This is what I came up with. Diappointment of the week: I spent most of it sick, having come down with a bug on the Tuesday before my vacation started and not feeling more like myself until this past Thursday. When I wasn’t hacking up a lung or trying to keep the cinder block that closely resembled my head from falling off my shoulders, I was sleeping (when I wasn’t working; thank God Friday afternoon came when it did). But, we honored our reservations down the shore for the Fourth of July holiday and though I wasn’t up to snuff, we had as good a time as we allowed ourselves, dodging the barbs of how it wasn’t Provincetown, by our usual Cape-bound traveling companion who was to meet us in Asbury Park, but even that turned into a convoluted hodgepodge of WTF’s, like it was our fault he didn’t go to Cape Cod, this year or last. Whatever! One night, in the club, when my way was barred to get to the men’s room by someone I tried to pass told me to go walk behind him instead, I told him he was an a$$hole and went about my business. But we saw a great fireworks display right from the ocean view terrace of out hotel room. Shock of the week: the verdict of the Casey Anthony trial. Really? I think these high-profile cases that are made available for the American public to witness, should be voted on by the American public along the order of American Idol. I think America would have gotten this one right! Excursion of the week: With my cold, or whatever it was winding down, we took my mother to The Sands in Bethlehem, PA for a little gambling and some lunch. It was a lucrative day for her; she cashed out about two-hundred dollars (from playing the penny slots) and between Ariel and me, we were down only about a hundred and thirty. Only? Humorous moment of the week–Part 1: Friday we had our dermatologist appointments in the city and we figured we’d make a day of it; see the doctor, meet up with Purdy for lunch and then head out to finish off the night in our new favorite haunt. I got into the examination room and changed into my gown and the doctor along with his two interns, a young man and young woman blustered into the room and he began to check me out, quizzing each of them on different things he pointed out. He pointed to my chest and with a serious tone, asked the guy “what’s this?” The intern had a quizzical look on his face and was silent for several seconds, not knowing what to say and I began to wonder what it was they were looking at. Finally, the doctor spoke up and said, “It’s a rose. It’s not that hard of a question!” and then he leaned into me and said, “I’m just f*cking with him”. He then proceed to check me out, front and back, grabbing here, tugging there. It’s bad enough when one person is in charge, but it’s disarming when he brings his own audience. Well, I went away with a clean bill of health! Humorous moment of the week–Part 2: What was nice about our lunch date after the doctor was that Purdy had taken off the rest of the day from work and we hopped around from bar to bar until he needed to go home and we would later head out to our final destination, knowing we’d have to behave because we had a surprise birthday party to get to by noon sharp. We went back to our room to chill for a while, back to the Desmond Tutu. This was one our two free complimentary nights from that infamous incident back in March and this time was a splendid stay. We even got a complimentary bottle of wine and a hand-written note from the manager. Well, our nightcap adventure never did materialize because we were zonked from our bar tour throughout the afternoon. We woke up the next morning, ready to shower and jump into our birthday suits (no, the clothes we brought for the party) and upon looking at the directions on the invitation, we discovered it was not until yesterday. Somehow we completely got our wires crossed. We gained and lost a day. We had made plans for yesterday, which we had to cancel so we could attend the party. Most Provincetown-like moment of the week: After we got home Saturday from our faux pas with the birthday party, we went to Joe’s Crab Shack and we had our customary summer vacation lobsters. In Provincetown, we have to have at least one lobster and at Joe’s Crab Shack, the Beantown Bake gave us each TWO 1-1/4 pound lobsters, clams, shrimp, a link of smoked sausage, boiled potatoes and an ear of corn and all at a bargain price, comparatively speaking to the Lobster Pot on Commercial Street. And lastly (the crowd roars! ), the Good News moment of the week: Looks like One Life to Live and All My Children have been saved by a production company called Prospect Park and they will run online after their last airdates on television. There’s been a lot of concern about this and a lot of infighting in the Facebook groups and so I’m not linking anything today until it gets sorted out. And that my dear friends was how I spent my vacation. The End. You know how I’ve always said my house is haunted–the noises I hear like things dropping; the time I heard Ariel come in the house, rattling his keys walking through the house when he wasn’t actually home for another 20 or so minutes; the times I heard furniture dragging across the floor upstairs? Well, for a minute there yesterday, I thought I found my culprit. But after some research, I decided I didn’t have a squatter living in my house, after all. In my mail, there was a flyer addressed to someone with the last name of the people that lived her before us and I presumed the company it was from didn’t come into existence until within the last nearly 13 years we live here. But I did some research and found the company had begun only 3 years before, so it’s possible she was a customer. I get mail for those people from time to time, but this was for a different person, that I can recall, at least. And I can probably use the coupon, so, that’s a win! So, when it rains, it pours. My vacation officially starts 5 hours after I begin work today and of course there’s that rain predicted for the 4th when we’ll be down the shore. But to add insult to injury, today is day 4 of being sick. I woke up in the middle of the night Tuesday in a sweat with a sore, scratchy throat that kept me up for the rest of the night. I figured, oh, it’ll clear up in a day or two, thankful my “summer cold” I seem to get every year (recent developement in the past few years) was hitting this week instead of next, but here it is Friday and my head is still like a block of cement. I was even so out of it the other day I did the unthinkable. I took a nap in the middle of the afternoon! So, we’ll see how much longer it lasts into my vacation time. Nothing but fun under this black cloud! But my garden is growing! The Casey Anthony prosecution rebuttal case continues today and then from what I understand, tomorrow will be closing arguments and then the jury will be deliberating over the weekend. You know I’m gonna be tuned in, in some fashion. I just don’t know. I think she’s guilty, through and through and where I thought her father and brother were involved in the cover up and that the mother was not, now I’m thinking differently, that the mother was as well. Now I’m thinking the brother wasn’t. Now I’m thinking the father wasn’t. Now I’m thinking he was. I sure as heck wouldn’t want to be on that jury. I sure as heck don’t want to be on any jury. Well, Happy Fourth of July everyone. 1892-1923: I pledge allegiance to my flag and to the republic for which it stands: one nation indivisible with liberty and justice for all. 1923-1924: I pledge allegiance to the flag of the United States and to the republic for which it stands: one nation indivisible with liberty and justice for all. 1924-1954: I pledge allegiance to the flag of the United States of America and to the republic for which it stands: one nation indivisible with liberty and justice for all. 1954-Present: I pledge allegiance to the flag of the United States of America, and to the republic for which it stands, one nation under God, indivisible, with liberty and justice for all.